Image: Marvel Comics. Darth Vader #4 Art by Giuseppe Camuncoli, and Cam Smith. Kieron Gillen, Salvador Larrocca, and Edgar Delgado’s Darth Vader series was all about reinstating Darth Vader as a relentless, unstoppable force. A Vader who, at the height of his prowess, was the most petrifying thing in the Star Wars galaxy. His new series, is diving into the character’s early years as a masked monstrosity—and in the process, gives us a much unrulier, vulnerable version of Vader. The Vader we see in Charles Soule, Giuseppe Camuncoli, and Cam Smith’s Darth Vader is one still struggling to understand the extent of what he became when Palpatine transformed the limbless, flame-licked remains of Anakin Skywalker into a towering hulk of steel and leather. Vader is still trying to accept not just the limitations of his new body—as well as the fact he is now without a lightsaber, an embarrassing mark for someone who was considered one of the Jedi’s finest warriors—but, in someways too, just how completely under Palpatine’s thrall he is, and how easily he got swayed into doing the dirty work that transformed the Republic into the Empire. There’s a lot of doubt swirling around the Dark Lord’s head at the minute, and even as we’ve seen him sent out on a new mission—find a lightsaber he can forge into his own Sith weapon, and exterminate the last remaining Jedi in the galaxy—it’s meant that we’ve seen a Darth Vader who is not quite the unstoppable enforcer he’ll become but one who can still mess up and fail. Darth Vader #3 Art by Giuseppe Camuncoli, and Cam Smith. 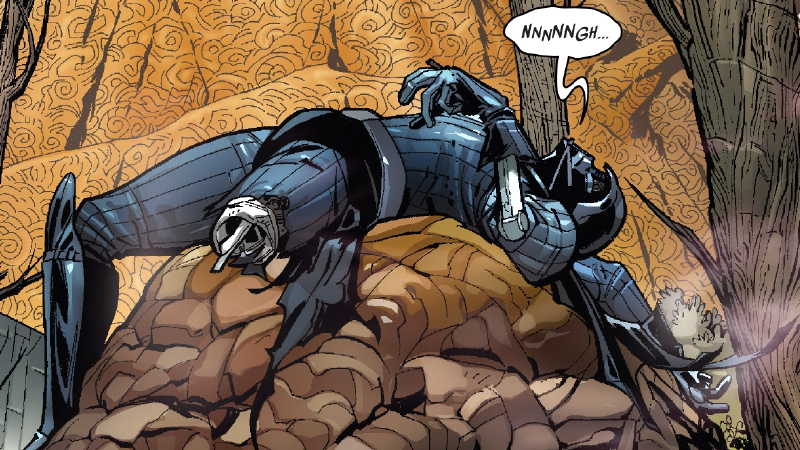 The last issue of Darth Vader explored just that, as Vader found himself challenging a lone Jedi in exile named Kirak Infil’a, and finding himself weak and unmatched, despite his attempts to persevere. That Jedi played with Vader, poked and prodded at what he could do, before casually kicking the snot out of the Dark Lord and tossing him off a mountain to his seeming death (spoilers: of course he doesn’t die, he’s Darth Vader). Darth Vader #4 picks up where that duel left off, with a broken and defeated Vader... literally, as bits of the Dark Lord’s cyborg body are strewn across his unfortunate crash landing site. It’s a strange scenario to see Vader in, one we’ve rarely seen—and one that really helps set this series apart from its critically-lauded predecessor. That series was all about seeing an unrivalled Vader at the height of his fearful power, while this one is showing us a Vader who has to fall and rise again. That persistence—a dogged relentlessness that would come to define Vader at his scariest—brings Vader to try to take out Infil’a again, having literally rebuilt himself with the parts from one of the Jedi exile’s training droids. But it also gives us an early glimpse at Vader losing himself, accepting the limits of his cyborg body and giving into the hateful monster inside himself that’s been created by it. Darth Vader’s relentlessness is, above all, driven by constant, roiling fury. Fury at what he’s become. Fury at the pain he feels in every waking moment. Fury for the people he’s lost. What Vader learns in his second encounter with Infil’a is how to not just bottle up that fury to persevere against unlikely odds, but unleash it and become an overwhelming storm of Dark Side power. Because of it, their second fight is almost over as it starts—in an act of pure, spiteful anger, Vader uses the Force to distract Infil’a by slowly destroying a dam protecting the city below them, threatening to wipe the whole place out just to get at the Jedi. So overwhelmed by the idea of someone being capable of such a heinous act, Infil’a is distracted long enough for Vader to lift him up with the Force, and let the old Jedi watch as Vader floods the city, killing hundreds and thousands of people—and only then does Vader break Infil’a’s neck and cast him down into the water. It’s a pivotal moment for the character, one where Vader becomes much more than a man—he becomes the monster Palpatine always wanted him to be. If one were wondering what need there was for another Darth Vader comic after Gillen, Larrocca, and Delgado’s seminal run came to an end, then this is it: a chance to see just how one of pop culture’s most iconic villains was forged into the machine-man we all know and fear.